Every business owner or homeowner deserves to know what is happening at their facility. PanaLog provides every customer that owns a Panasonic Telephone System this extra added value of call management and an extremely powerful software program. PanaLog can measure and evaluate all call activity, employee productivity, business growth, long distance bills, telephone abuse and much more. PanaLog puts you in control and lets you view all call activity, or zone-in on specific calls, employees, dates, departments, etc., with our easy point-and-click menu options. 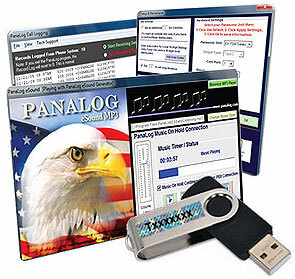 PanaLog allows you to produce powerful reports and graphs in seconds. Including: Calls by Extension, Calls by Account Code, Call Durations, Talk Time Averages, Calls by Area Code, Calls by Hour, Line Usage/C0 Lines, Mos! Frequently Called Numbers, Cells of Longest Duration, Call Accounting-Billing, Caller ID', DlD*, Inbound Calls, Outbound Calls. Data Reports Include International, Local, Long Distance, and Toll Free reporting; as well as Rlng Duration, Calls not answered. *Note: Caller ID or DID service is necessary for Inbound caller Identification. Caller ID Service or DID configuration must be Installed In your telephone system and Caller ID Service or DID Service ordered from your local telephone company. Telephone System SMDR Programing Required.